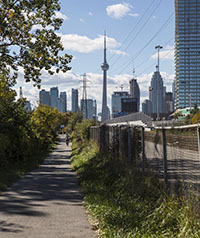 The trail in the Don River Valley Park runs alongside the river, connecting Toronto’s urban neighbourhoods and their communities to valuable greenspace. Experience the art along your trip down the trail, or enjoy a moment along the river. Need help figuring out where all the trails connect? 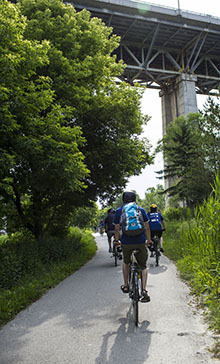 Our guides can get you to the Lower Don from Flemingdon Park, Thorncliffe Park and Taylor Creek (PDF, 3MB), as well as from downtown (PDF, 4MB). Visit our Park map for more information on the Park and connecting trails.